The Youth Melisma dress has a shallow sweetheart neckline. The neckline in the back, as pictured in the smaller photo above, comes up to the neck bone. 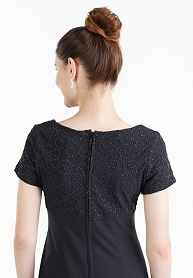 The short sleeved bodice is made in our caviar beading that has a subtle sparkle when under the lights. The floor length, princess style skirt is made in crepe and has a full sweep. FWO Extras: Do you have adult members in your group? Our Adult Melisma Dress for Performers is just what you need.